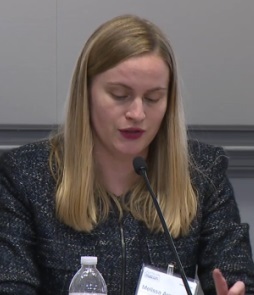 Melissa Armstrong of the SEC at an FTC event today. Source: FTC video. Melissa Armstrong, assistant chief litigation counsel for the U.S. Securities and Exchange Commission (SEC), was one of the featured speakers. Her topic was the SEC’s pyramid- and Ponzi case against TelexFree and how TelexFree was a form of affinity fraud. In her view, Armstrong said, some TelexFree promoters exploited members of the Dominican and Brazilian communities. And, she told the audience, the scheme spread over YouTube, Facebook, Twitter, Instagram and though local pitchfests. “They sold a version of the American dream that was [meant] to appeal to recent immigrants,” she said. “Ministers” of church congregations helped the scam spread, Armstrong said. Armstrong also touched on TelexFree’s April 2014 bankruptcy filing. And, without mentioning TelexFree co-owner Carlos Wanzeler by name, she said he “fled to Brazil” and now faces criminal charges in the United States. Former TelexFree President James Merrill also faces criminal charges. The SEC now has a “newly established pyramid-scheme task force,” Armstrong said. Armstrong’s remarks begin at about the 4:22 mark below. More information on the “Fraud Affects Every Community” FTC symposium, including the roster of speakers and topics, is available here. Please do not only talk about the Brazilian and Dominican Immigrants but also include the poor Africans especially we in UGANDA! This thing was more in Uganda than any other African Countries. Can you imagine defrauding someone who lives on less than two dollars a day! Any way i thank you once gain for your endeavors in informing we the gullible and partially informed masses here in Africa! Patrick, is it necessary at this point in time to assist the FBI and HSI as a victim? Godfrey wasikye: Patrick, is it necessary at this point in time to assist the FBI and HSI as a victim? Please see the page below. It is by the U.S. FBI and the U.S. Department of Homeland Security. You’ll notice a link to a questionnaire near the bottom. BECAUSE WE CAN NOT RECOVER FROM THIS DEADLY LOSE.